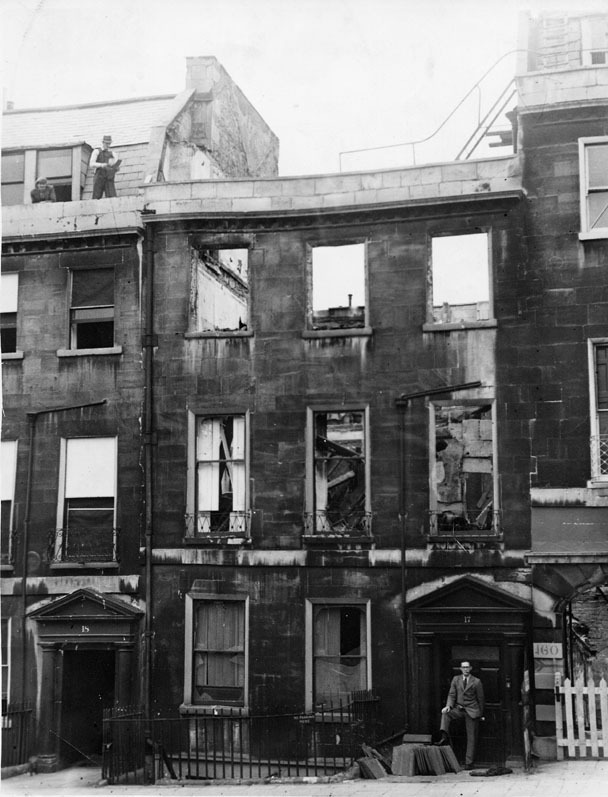 The action by the workmen immediately after the raids was to board up broken windows, to keep out the rain with tarpaulins, or to do simple repairs so that a building would not be a danger to its occupants. The workmen used whatever became available. If frosted glass was supplied to them, then they fitted frosted glass. Even if it meant that a room then had windows that could not be looked through, it was better that the room was lit by daylight during the day than relying on electric lights all the time because the windows were boarded. If Bath stone was not available but red bricks were, that is what was used. Even today, some Bath stone buildings still have wartime brick chimney stacks or repaired walls. But the living conditions were far from ideal. Boarded-up windows let in no light, and tarpaulins were noisy in the wind. Even the expedient of installing white cloth on a frame in place of a smashed window in the main living room only let in a little light, and required the refitting of blackout curtains before the room could be used at night. These were not long term solutions. The City Engineer's Report was useful to identify those houses that were unsafe, but could easily be made safe. For instance, if the only reason why a house was unsafe was because a wobbly chimney stack was likely to topple and fall through the roof, then that chimney stack could be dismantled to remove the danger, and then the house could be lived in again. 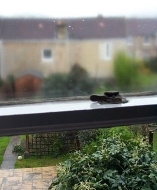 Over the following months, boards over windows were gradually replaced by new glass, allowing daylight in once again. Similarly, as slates or tiles became available, houses could be re-roofed. As building blocks became available, damaged walls and chimney stacks could be rebuilt. As plaster or plasterboard became available, fallen ceilings could be replaced. Some of the wartime glass was of poor quality, but even so, some of it survived for a long time, as can be seen in the modern picture on the left. Compare the clarity of the wartime pane in the top window with the modern replacement below it. Meanwhile, damaged and dangerous buildings were demolished (the picture on the right shows a demolition in James Street West). 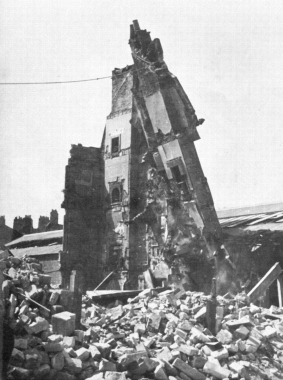 But the more seriously damaged repairable buildings were not tackled for many years after the war. The process of identifying the casualties continued for a long time. Because so many were injured in such a short time, not all the seriously injured could be treated in Bath, and hospitals in Bristol and other towns around Bath took some of them, often without information about who they were or where they had been rescued from. Some died of their injuries and it sometimes took a long while to trace them back to Bath. Alternatively, some who had been presumed dead could be identified as Bath survivors once they recovered consciousness. Other casualties were visitors to Bath, and unless they could be identified by documents they carried or entries in hotel registers, they depended on subsequent enquiries by relatives or friends to establish that they had been killed in Bath. Some were so close to an explosion that their bodies were burnt or decimated beyond recognition, or indeed, could not be found at all. Wherever possible, those searching for friends or relatives were asked if they could recognise jewellery or fragments of clothing. Eventually, the Bath Coroner issued Death Certificates showing "Missing, presumed killed by enemy action" for a small number of people who has apparently vanished without trace. Inevitably, a number of owners of bomb damaged property are disappointed that repairs are not taken in hand more quickly. Having received notification that they are entitled to a cost of works payment for totally demolished houses, they overlook the continuing shortage of labour and materials and expect work on re-erection to be put in hand straight away. "This is impossible" said the Bath City Engineer in an interview. "Directed by the Government, the Corporation has to see that a little bit of work is done for a lot of people rather than a lot of work for a few people." "The authority has to view the damage as a whole, whereas the private owner tends to see only the need of work on his own property." From a resident's point of view, rebuilding was something urgently needed. Most householders were buying their house with a mortgage, and mortgage repayments on their ruin had to be paid as well as rent on their temporary accommodation. But from the point of view of the authorities theirs was not the highest priority. The Council tried to get this message across through newspaper articles, like that in the box on the right. Shortages of manpower and materials during the remainder of the war meant that difficult repairs were only attempted where it was important to help the war effort. Repairs to railway bridges and weapons factories were much more important than shops and offices. 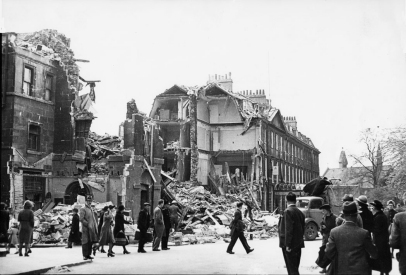 However, by 1944, arrangements had been put in place so that rebuilding of destroyed or demolished dwellings could start. There was a lot of bureaucracy: approvals had to be obtained from two Government Departments and a Bath Council organisation, but at least the householder knew that once approval had been given, it had been established that there were enough materials available to build a replacement house. The intention was that the replacement dwelling would be the same size and layout as the original, but economising on materials. Thus there would be no decorative stonework unless it had been salvaged from the rubble, skirting boards would be 3 inches (7.5cm) high instead of the traditional 6 inches (15cm), and garden walls, gates, fences, sheds and outhouses would be omitted until much later when materials became more plentiful. All the work was done by council workmen. Once the war was over, the Government changed its policy. Council workmen were no longer allowed to rebuild, only to repair. Any householder waiting for a rebuild had to wait for the council to invite tenders and get approval from a Government Department for its preferred contractor. Such approvals were given only when it had been established that there were sufficient materials available to complete the tendered work, so some were subject to delays. However, these tenders did include garden walls, whilst those who did have their houses rebuilt by the Council Workmen had to wait several more years before approval was given to rebuild theirs. After the war, money was scarce too. 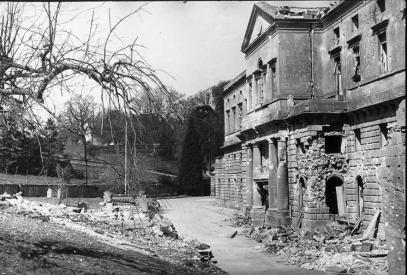 Government funds were available to repair war damage (indeed, by the end of September 1945, Bath had received £1,570,738 of Government money to repair war damage), but the Government would not pay more than a building's market value towards the cost of restoring it. In most cases this was sufficient to repair or rebuild the Edwardian and Victorian terraces in the suburbs in their original style. 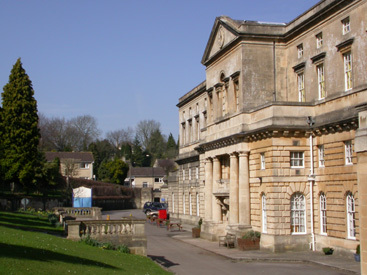 But this restriction led to some buildings that could have been repaired being pulled down instead, and some of Bath's heritage remained derelict for many years after the war ended. Eventually, Heritage funding became available to restore listed buildings. 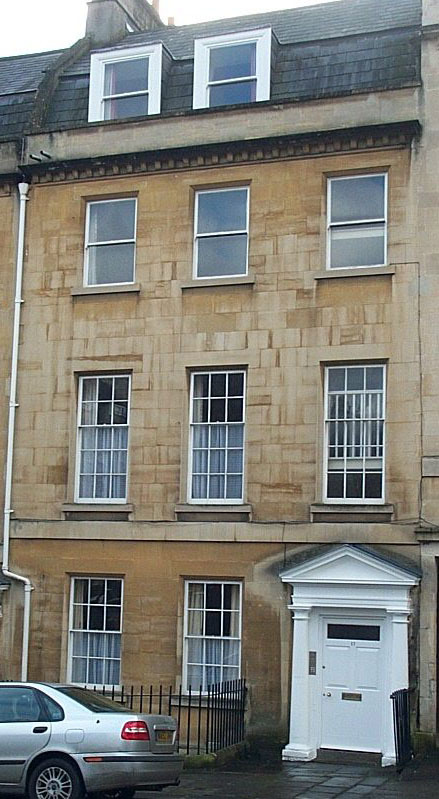 Virtually all of Bath's famous Georgian heritage was restored over a period of time, and in most cases it is difficult to see where the original buildings end and the post-war reconstruction begins, because the style and materials used were faithfully replicated. The pictures below show the skills of the craftsmen who did the rebuilding. 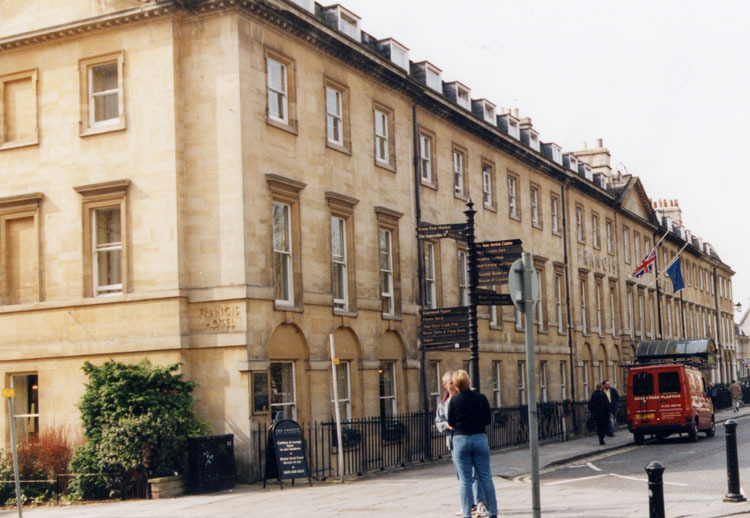 Similar "as original" restorations took place on blast damaged buildings in Norfolk Crescent, The Paragon, Westgate Buildings and Lansdown Place East; and on incendiary damaged buildings in Royal Crescent, The Circus and The Assembly Rooms. Such restorations take time, and some of Bath's heritage remained derelict for several years. 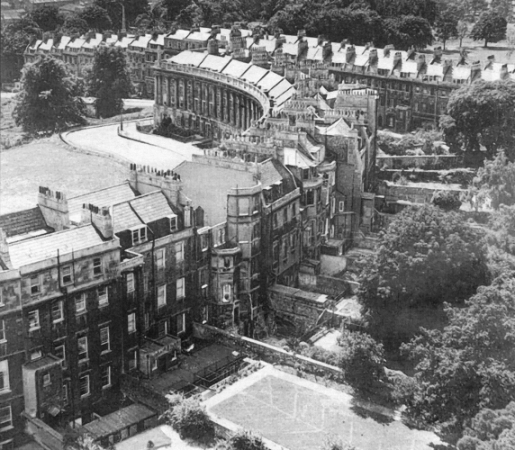 In the aerial photograph below, taken in the early 1950s, number 17 Royal Crescent is still just a shell without a roof, having been burnt out by incendiaries in 1942.